I&apos;m almost there. My route to Jacques Cartier Park&apos;s marina, Rue Wellington Street, avoids Ottawa&apos;s business district and allows me to skirt traffic snarls while taking in stunning views of the midnight-blue Ottawa River. Lined along the banks of the waterway that the explorer Cartier once sailed en route from Canada&apos;s Maritime Provinces to Montreal are the capital city&apos;s Gothic Revival government buildings: Parliament Hill, the Supreme Court, the National Archives, and across the Rue, the Currency Museum. A few turns get me past the National Gallery and War Museum and over the Ottawa River via the Pont Alexandra Bridge. Old Canada is on display for me, a newcomer to the province. Once I boarded the 40-foot Doral Mediterra in Jacques Cartier Park, I discovered a completely new impression in the shadows of those buildings. 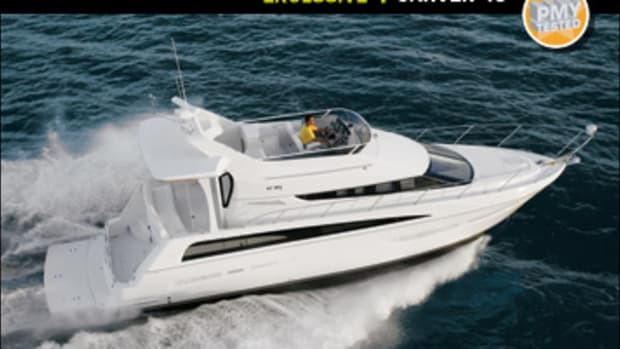 For my test boat came standard with Volvo Penta&apos;s IPS drives, and while the technology is about two years old, it&apos;s new to Canada: I learned from Doral&apos;s R&D director Christophe Lavigne that the Mediterra is the first boat built there that&apos;s equipped with IPS. Since its introduction IPS has been improved by the introduction of an optional joystick control to enhance close-quarters, low-speed maneuvering. 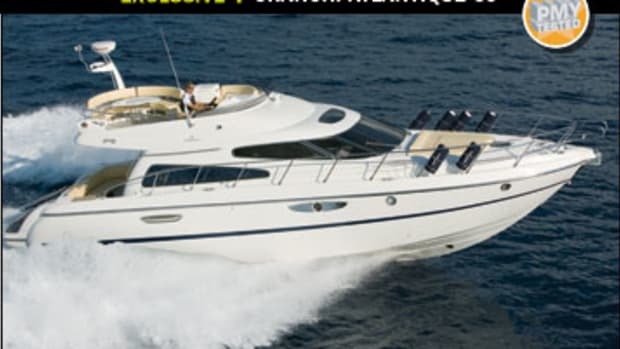 On the 40 the control was easy to reach, just in front of the Volvo Penta single-lever controls. The joystick is $16,820 but, as far as I&apos;m concerned, worth every penny. After practicing with it for about five minutes, I was able to dock the 40 with ease, literally moving her sideways to a fuel dock against a two- to three-knot current and later spinning her around in a crowded marina and into her slip. 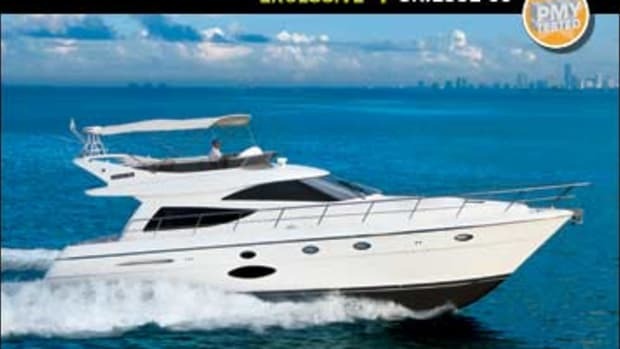 Just push the joystick in the direction you want to go, and the boat responds. By turning the top of the joystick, you can spin the boat to port or starboard while she&apos;s moving or stationary. To disengage the joystick, simply push the controls in gear, and you&apos;re back on the wheel. 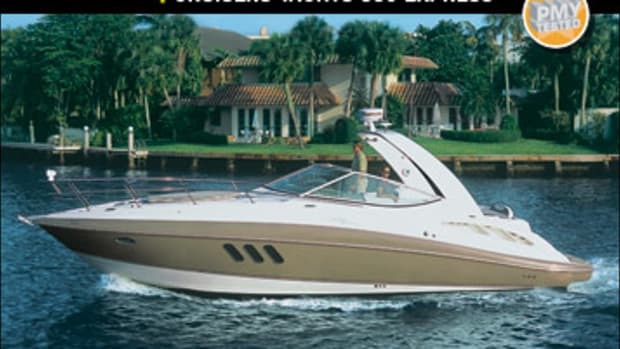 And while the joystick&apos;s rpm range maxes out at around 1200 rpm, the rpm ceiling can be adjusted for boaters who contend with strong currents or for those who wish for a bit more oomph. 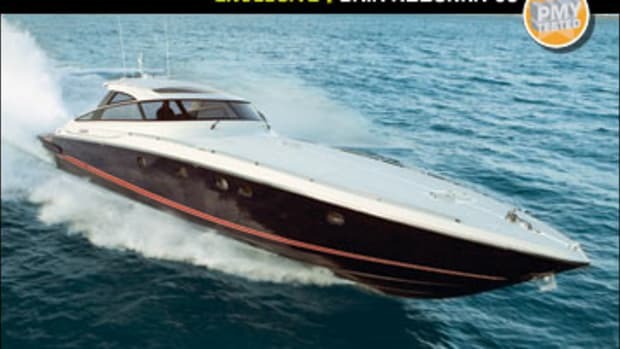 Lavigne mentioned that while his team was designing the Mediterra, they were working closely with Volvo Penta engineers to match the 40&apos;s hull design to accommodate the IPS drives. I&apos;d say they got it right. 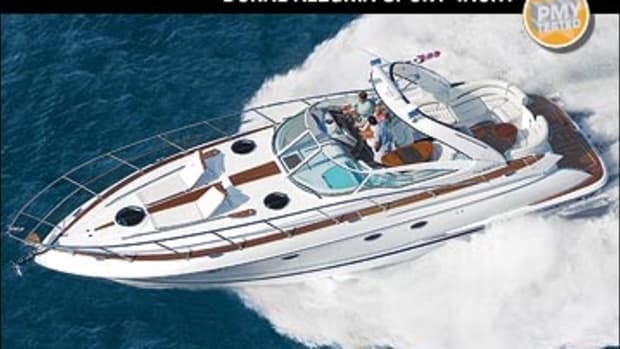 Most notable was the simply superb combination of Volvo Penta&apos;s electronic power-assisted steering with the Doral&apos;s hull. The relatively flat aft sections that accommodate the drives also provide generous lift, helping her get on plane in just over ten seconds. With little wind on test day, the Ottawa River was flat, and the 40 put on a clinic: She was agile at all speeds, and as I pushed her to WOT, she responded by carving tight figure eights and smooth, 180-degree turns in just a few boat lengths. 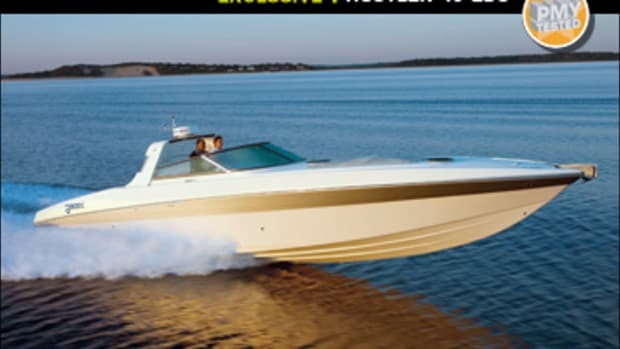 Once she was at speed, her forward chine flats kept the windshield dry without me having to touch the Lenco trim tabs. I found sightlines excellent in all directions, although her hardtop supports caused a blindspot to starboard; craning my neck a bit through the opening between the hardtop and windshield all but obviated this. 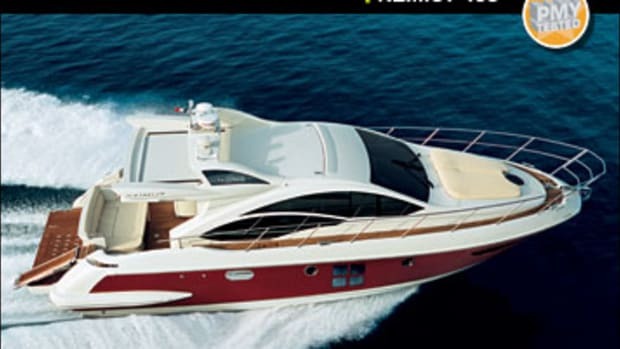 The combination of the Mediterra&apos;s hull and Volvo&apos;s IPS system made the 40 a virtual fuel sipper. She managed 1 mpg or better throughout her rpm range, and at her cruise speed of 34.5 mph and 3000 rpm, she burned 30.2 gph, good for a range of 371 miles. She also displayed some giddy-up, reaching a top speed of 43.4 mph. Back at the dock, I was able to give the 40 a thorough below-decks inspection. The first thing I noticed after entering the saloon via a centerline companionway is the muted color scheme. The beige Ultraleather settee and light gray carpet provides a nice contrast to the suede aft bulkhead and headliner. Instead of a boring monochromatic interior, the light shades worked well with the honey-colored makore wood cabinetry. Makore is used on the forward bulkhead, the pocket door that leads to the forepeak master, and on the curved cabinetry that hangs above the starboard side, C-shape settee and in the port galley. 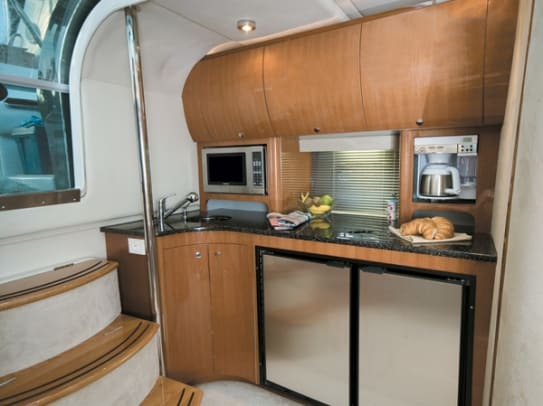 I was impressed with the galley&apos;s copious counter and stowage space: With a standard 6.2-cubic-foot refrigerator and separate freezer, three cabinets, and an 86"L x28"Wx15H" in-sole stowage space, there&apos;s plenty of room for sundries for a family of four over several days. I also like the choice of black Corian countertops, as they provide contrast to the rest of the decor. 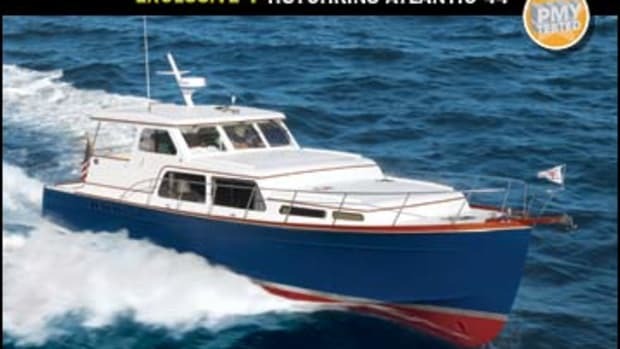 One thing I wasn&apos;t too keen on was what was optional equipment on our test boat: air conditioning, a 4-kW diesel genset, Quick windlass, and most surprising, the coffee maker and teak sunpad chairs. While most customers will likely choose these items, I&apos;d like to see Doral make them standard equipment. I also was torn on the hardtop: While it provides more than eight feet of standing headroom, it&apos;d be nice to have the option of an electrically retractable roof panel to let in some sunshine. The fixed triangular windows in the hardtop roof brought in little light and provided no ventilation. 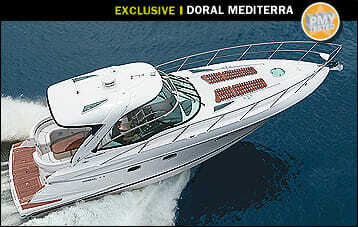 So how will the Mediterra fare stateside? 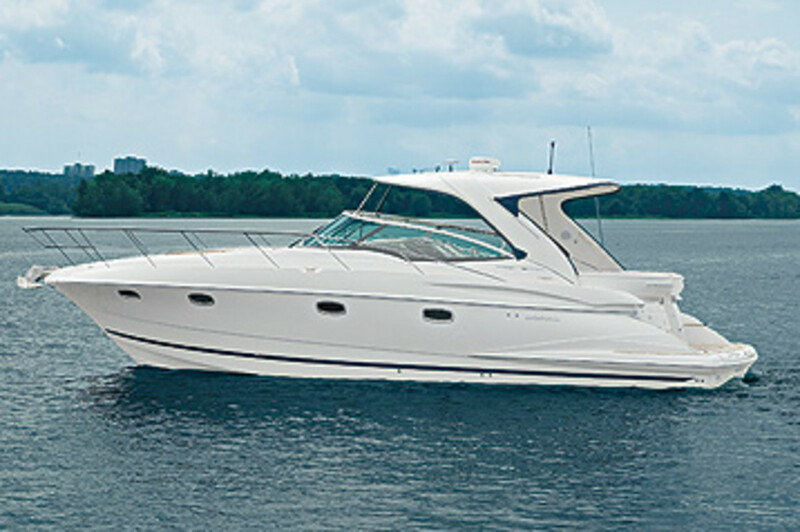 A two-cabin, two-head layout, roomy galley, and sporty handling will no doubt make many buyers want to take a closer look. And I bet many will opt for IPS as well, adding the joystick that&apos;ll make close-quarters handling less stressful. I ponder this as I leave the Cartier Park marina facility, and as I pass a statue of the French explorer, I recall that he had failed on his mission to find a northern route to China. But he&apos;s revered as Canada&apos;s equivalent of Christopher Columbus, as he is credited with discovering the country. Time will tell if Doral&apos;s inroads with its larger, luxury sport yachts will command the same respect in the States that its smaller vessels have enjoyed.